Four ways these functions, merged, could help forge a sophisticated engine for mass recruitment. Recruitment and retention have traditionally been the sole domain of the human resources team, with corporate real estate (CRE) matters handled down the proverbial hall. But, spurred by the fast-changing nature of work, forward-looking organizations are unearthing new opportunity by merging these two functions together. The right workplace experience, in the right place and at the right time, can feed recruitment goals. And deep understanding of HR needs can help workplace strategists ensure they make the “right” decisions for their people. Google continues to serve as a shining case in point of how organizations can wield their workplace in the war for talent. Its new London headquarters will have a rooftop running track, basketball court, and half Olympic-sized swimming pool, amongst other amenities that should theoretically help the tech giant attract and retain the best and brightest. This is certainly not the first time Google has invested in an idyllic workplace. Like others in tech, its leaders recognized early on how the workplace could more than just a set of bricks and mortar—it could be an active agent in the HR wheelhouse, too. 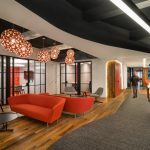 As more high-profile workplaces like this continue to crop up and inspire others, we can expect other organizations also to recognize the power of integrating HR and CRE priorities. And in some ways, it’s only a matter of time, when you consider the significant ways they complement each other. Today’s job-seekers demand more from their workplace than in previous generations. Millennials in particular are infusing new life into the corporate world, with their high expectations for modern amenities and unique experiences. More than ever, the right workplace environment really can make or break an offer. The key intersection between HR and CRE lies in understanding the import of the human experience. According to JLL research, an employee’s experience in the workplace directly affects the way we engage with one other, and with the larger organization. It’s intuitive: when humans have meaningful experiences at work, we become more invested in their relationships and experiences there. Moreover, we crave that sense of investment at work—a full 87 percent of survey respondents said they want to commit more of their personality to their working life. Human-oriented workplaces help your organization stand out from the corporate crowd. From the inside, out, an inviting workplace affords a highly visible way of differentiating your business from the competition. This can help nurture employee sense of belonging as well as shape external public perception. A star-worthy workplace can appeal to star talent. Tech titans haven’t been investing in amenities for laughs—they know that by investing in facilities where employee happiness is a clear organizational value, they are also investing in attracting world-class talent, and in turn, world-class productivity. Future-friendly facilities can help drive PR and marketing. Forward-thinking organizations are leveraging real estate and HR strategies to market the value of their business through both the physical space and the people who inhabit it. A positive environment feeds human experience. Engagement, empowerment and fulfillment may be banner words for HR teams, but they’re also achievable goals for CRE teams. When the workplace moves people to push themselves to fulfill their personal greatness, more collective successes will follow. These types of benefits are best achieved when real estate and human resource teams work seamlessly together to achieve shared goals. After all, acting alone, CRE teams could have trouble garnering budgetary approval for an amenity-rich facility, which could be seen as a simple line item on a balance sheet when it could actually offer so much more business value from an HR perspective. On the other side of the hall, an HR team tasked with boosting staff engagement could have difficulty with the practicalities in a workplace that doesn’t account for HR values. Acting together, however, HR leaders could help make the case stronger for the higher caliber location, and CRE expertise could help create environments where engagement and collaboration comes naturally. Some organizations are already actively looking more holistically at the intersection of HR and CRE. The Google executive responsible for the London project, for example, comes from the real estate and construction side of the business. But his conviction that the company’s offices help shape the Google culture underscore his alignment with corporate HR goals, too. Meanwhile in Menlo Park, California, Facebook’s vice president for real estate and facilities talks of the campus as “one we are lucky to call home.” Under his project leadership, the corporate village will include 1,500 apartments, a grocery store and offices—a truly unique work-live-play experience that is certainly likely to support recruitment and retention. While few employers have the resources to compete in the same field as the latest Googleplex, running tracks are also not likely to be the solution in most cases. The true potential lies in recognizing the underlying opportunities in the workplace, and collaborating to develop new strategies appropriate to your organization. Management teams that fuse HR and CRE will include more people who specialize in motivation issues, as well as those who can use workplace design to inspire people their organization seeks to recruit. Together, they can be a formidable weapon in the war for talent and key to transforming a business as a result. That’s why, in my view, we aren’t far off from the day when CRE and HR teams will operate as one team. And that’s a good thing for our people and our profits.